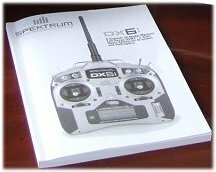 The Spektrum DX6i rc system brings 2.4GHz radio control technology to the beginner / intermediate flyer, at a very affordable price. Having a DX6i in my transmitter collection, it's only fair that I share my thoughts by way of this 'user review' with you, and hopefully help you decide whether this system is for you or not. Spread spectrum rc technology is now commonplace in the hobby, all but replacing the traditional MHz radio systems. The introduction of this new 2.4GHz technology was the biggest shake-up to happen in radio control since the introduction of FM radio systems in place of the original AM ones. Incidentally, the name spread spectrum is actually the general name for this type of radio transmission technology; rc manufacturers have come up with their own specific names for their protocols, the Spektrum type being designated DSM - Digital Spectrum Modulation. DSM2 and DSMX are the updated versions. By far the biggest benefit of such rc technology is that it's virtually impenetrable to outside interference, because of the way the transmitter communicates with the receiver; radio signals are sent from Tx to Rx, as in FM systems, but that's really where the similarity ends. This interference-proof system, although not 100% infallible, is of course perfect for rc use. No more do you have to worry about someone else turning on a transmitter of the same frequency, no more do you have to remember to put your peg in the club frequency board - with 2.4GHz, it's just switch on and fly! Above: my DX6i as purchased. The DX6i is sold as a beginner/intermediate radio control transmitter suitable for the majority of rc airplanes and the smaller/intermediate electric helicopters. Developed from the pioneering DX6, the DX6i bridges a gap between basic 4-channel rc transmitters and overly-complicated 8+ channel ones. At around the $200 mark, it's an affordable Tx that offers more than enough functions and features for the average club pilot, and especially for the beginner. 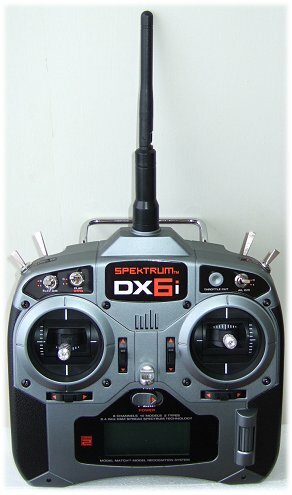 The Spektrum DX6i transmitter can either be bought alone or with a receiver. Different countries might offer different packages, and one difference you might find is which batteries are included. Mine was supplied with 4 AA disposable cells, whereas some are supplied with 4 rechargeable ones and a wall charger. I have read complaints about separate disposable cells being supplied with such a transmitter, instead of using a soldered pack, with users drawing a comparison between the DX6i and toy rc transmitters because of it. That's fair enough I think, and indeed I did buy 4 good quality high capacity NiMH cells to use in place of the ones supplied. But, the advantage here is that you can carry 4 top brand cells with you as an emergency back-up, and change them in a second should your NiMH cells be getting low. While on the subject of batteries, 2.4GHz rc systems are more efficient than the previous FM technology, and so can operate on lower voltage. This is why the DX6i takes only four AA size cells, as opposed to the usual 8 required in FM transmitters. If you're buying a package that includes a receiver, then you'll also find a bind plug in the box. A paper manual is also included, and this can also be downloaded online if required. First impressions show the Spektrum DX6i Tx as a nice piece of kit, with all the right sticks and switches in all the right places. On picking it up for the first time though, you may see and feel it as a bit 'plasticy' and not particularly macho. But the overall feel is comfortable, and everything falls naturally at or within easy fingertip reach. A 60mm x 25mm LCD screen is bottom center of the Tx, to the right of which is the DX6i's unique feature, a vertically aligned roller wheel with which you access all the programming functions. It's very simple and intuitive to use, just click and roll to scroll through the various menu options. The toggle switches on top of the Tx are Mix/Throttle Hold, Rudder Dual Rate, Gear/F-Mode (flight mode, normal or stunt for helis) and finally the Trainer switch. On the Tx face, the switches are Elevator Dual Rate, Flap/Gyro and Aileron Dual Rate. In addition to these 3, there is a Throttle Cut button, a nice touch for immediate motor shut-off in that emergency situation. The toggle switches feel good and solid, and the main stick movement is smooth. These two main sticks are adjustable in length, and the tension is also easily adjustable from inside the transmitter. This is something that I did straight away, as the throttle stick was way too easy to move in my opinion, and a lack of ratchet on this stick means higher tension is definitely required. The trims are digital, with a seemingly good range - certainly more than enough for initial flight tests until servo horns and rods are adjusted accordingly. Firstly, the black sides of the body are textured for grip, but they are still hard plastic and so the surface is not slip-proof. A rubber compound material would have been much better here, but presumably that would just up the price of production. Second, the main power switch feels cheap with a bit more movement than just a definite on/off click. Another gripe is that the top mounted toggle switches are labeled with small adhesive stickers that look like they could peel off at any moment, and my final whinge is that the battery compartment cover is in no way secure. The catch does not engage well and so the cover can be slid off without even trying. Having said that, the batteries do seem a very tight fit between terminals, and I think it's highly unlikely that the cover will drop off and a cell will fall out - I hope! So, although the Spektrum DX6i transmitter isn't perfect, it is perfectly adequate for those who haven't yet risen to the heights of professional rc flying! Maybe the overall impression is a bit 'plasticy', but we have to accept that there aren't many products around these days that do ooze quality. And for the price, I think the DX6i is a very good deal. The receiver supplied with the Spektrum DX6i is (at the time of writing) the AR6200, which is Spektrum's 'middle-of-the-road' Rx, with full range capability and suitable for the majority of electric and gas airplanes and helicopters. The AR6200 is actually a pair of receivers; the master Rx into which everything connects, and a smaller satellite receiver connected by a 150mm long cable. The reason for this is simple - double security. Because it has two separate receiver units, the AR6200 can be mounted inside the aircraft in such a way that the antennas can be perpendicular to each other and at different locations within the aircraft, thus absolutely maximising the ability of the receiver to receive the signals from the transmitter. And on that note, the Spektrum DX6i does actually broadcast its signal on two different frequencies within the 2.4GHz band, which further doubles the security. If for any reason one signal is temporarily lost, the other one is still being received by the Rx. The AR6200 aside, there are several Spektrum 2.4GHz DSM2 receivers that can be used with the DX6i, namely the micro-sized AR6000, AR6100/6100e and the AR6300 for Park Flyer and micro helicopter use, and the AR6200, AR7000 and AR9000 for full range use in larger aircraft. These latter three are all dual-Rx receivers each having a master and slave unit. Incidentally, the difference between the single receivers and the dual receivers is in the range. The smaller Park Flyer ones do have a limited range and should only be used in smaller electric airplanes and helicopters, while the larger dual-Rx ones will continue to receive the transmitter signal long after your model has flown out of sight. Receiver update: since writing this page Spektrum have changed which Rx is supplied (if at all) and at the current time (2016) it's their AR610. I'm sure this will change again soon. 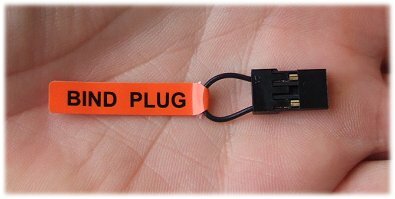 This small item is essential for binding the receiver to the transmitter so that only that specific Rx will respond to the Tx signals for that aircraft. Each separate receiver must be bound to one of the ten model memory positions on the Tx and, once bound, will only respond to that exact choice of model from the Tx list. 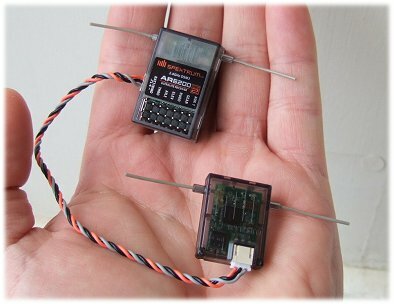 When binding, the transmitter emits a digital code unique to that model memory, which the receiver learns and stores. The code is one out of billions of possible codes and this is why a bound Rx will never respond to Tx signals meant for another receiver. The binding process only takes a few seconds to complete, and only has to be done once. Make sure the desired model memory (1-10) is selected on the transmitter. Connect the bind plug to the Batt/Bind slot of the Rx. Connect the Rx battery pack to any one of the 6 remaining slots on the Rx, via the switch harness. Turn on the switch to power up the Rx, check for flashing LEDs inside both receiver units. Wait a few seconds for the Rx LEDs to stop flashing and stay on continuously. Turn off Tx and Rx. Dual aileron / elevon / flaperon / V-tail mixing. Gyro adjust, graphic throttle curve, graphic pitch curve, P-mixes, Revo mix, Swash type (Normal, and CCPM 120) for helis. Probably the biggest let-down in the Spektrum DX6i package is the 'instruction' manual. While it looks chunky and full of everything you'll ever need to know, it is in fact no more than a very basic guide to accessing all the functions and features on the DX6i. In fact, it merely tells you what you could probably learn just by playing with the transmitter for ten minutes! The manual does not tell you how to program your model correctly; presumably Horizon Hobby view this as potentially just too big an area to cover given the number and variety of models that the DX6i will be used on. For specific programming info, it's either a case of trial and error, getting the info online or phoning the HH support number and crying for help! 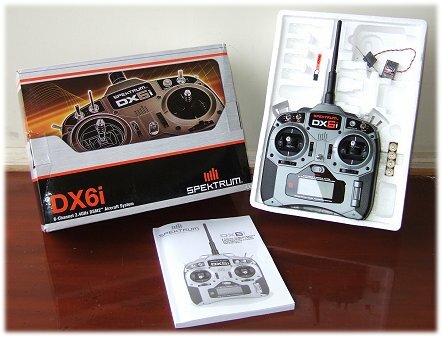 In summary: the Spektrum DX6i is, in my opinion, a very good value rc transmitter for anyone who flies rc at a Park Flyer / club level, either small to medium size helicopters or airplanes. Making the jump to 2.4GHz technology is without doubt the right thing to do, and this particular radio set offers a great opportunity to do that. While its quality may not be top-of-the-tree, it is perfectly acceptable and good for the money. The sheer number of DX6i's out there now is testament to its popularity and success. Spektrum radios are very popular now, and do represent some of the best value units available. As a result they are easy to find, and any Horizon Hobby dealer should have them. If you don't have a local model shop you can support, or if you just prefer buying online, Amazon is a good a place as any these days - all the big (and small) sellers can be found there, including Horizon themselves.